Half Dome is a granite dome in Yosemite National Park, located in northeastern Mariposa County, California, at the eastern end of Yosemite Valley, possibly Yosemite's most familiar rock formation. 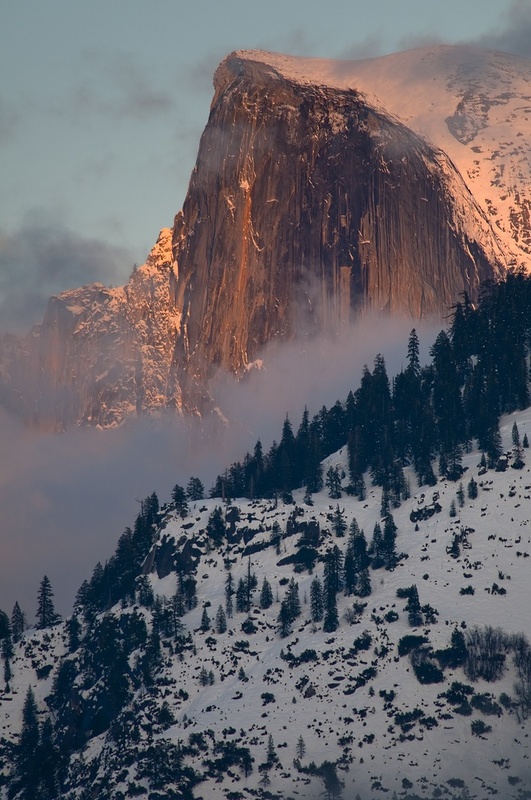 The granite crest rises more than 4,737 ft (1,444 m) above the valley floor. Half Dome is nearly as whole as it ever was. The impression from the valley floor that this is a round dome which has lost its northwest half is an illusion. From Washburn Point, Half Dome can be seen as a thin ridge of rock oriented northeast-southwest, with its southeast side almost as steep as its northwest side except for the very top. Although the trend of this ridge, as well as that of Tenaya Canyon, is probably controlled by master joints, 80 percent of the northwest "half" of the original dome may well still be there.